A total solar eclipse has many stages from start to finish, these stages create a range of effects that can be seen by the observer. Some of these phenomena can last up to an hour or so where others can last split seconds. Check our eclipse phenomena page to know what to look out for on eclipse day. 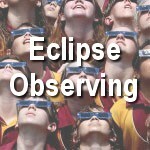 Your viewing location is very important when it comes to solar eclipses. The most important aspect is ensuring that you’re inside the path of totality. See our Maps section to see the path of totality across America. Being inside the path of totality means that the Moon will completely obscure 100% of the Sun. Even a 99% eclipse is no comparison to a 100% eclipse. Just 1% of the Sun is still enough to render the delicate structure of the solar corona invisible and still make it too dangerous to watch the Sun unprotected from the harmful UV rays. The surrounding sky would still darken but not to the extent that a 100% total solar eclipse will create. Does it matter where in the path of totality you are? If you are located anywhere inside the path of totality, you are in for a treat but does it matter how close to the central line you are? This is a matter of opinion but most professionals agree that the differences in totality length are fairly minimal to the observing experience unless you are right on the edge of the path. If you were located in Casper, Wyoming for example, one of the more preferable locations for witnessing the eclipse due to it’s close proximity to the central line and reasonable weather prospects. Casper gets 2 minutes and 26 seconds of totality. However, even if you were located 20 km North of this location in the Antelope Hills, you would still witness a totality of around 2 minutes. Another 10 km North and you’ll still enjoy up to a minute of the Moon’s shadow. The time then begins to reduce dramatically the closer to the edge of the eclipse path you get. The rule of thumb is to ensure you are at least 10 km inside the eclipse path. Being closer to the central line is preferable but it’s best not to make sacrifices for the sake of a few extra seconds of totality. Weather will likely be a far more important factor in your decision making. If it’s clear weather 20km South of the central line, it’s a good decision to sacrifice a few seconds of totality to get a clear view rather than get the a full 2 minutes and 23 seconds of a clouded out eclipse. In order to observe the first (and last) stages of the eclipse known as the partial phase, you will need a reliable and safe way of observing this stage. It goes without saying that extreme caution should be taken when attempting to look at the sun. You should never under any circumstances look directly at the sun without the appropriate protective eyewear. Eclipse shades will no doubt become a popular choice when viewing the partial phase of the eclipse on August 21, 2017. These are safe as long as they are used properly. Be sure to look away from the direction of the sun before putting eclipse shades on or taking them off. Take care of them and check for any scratch marks or holes. Any damage to the protective film will render them useless against the sun’s damaging UV rays. 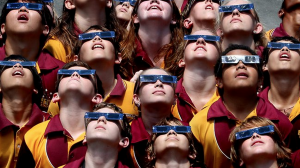 Eclipse viewers are available to buy from here. This is a much safer method of viewing the partial phases of the eclipse. It’s a very simple method of projecting the sun on to a piece of card or a shaded surface via a pinhole. 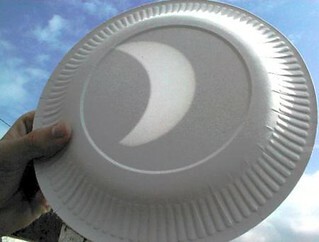 The results can be quite pleasing and allows groups of people to witness the eclipse as it progresses. These projectors come in all kinds of shapes and sizes. Decent shading and a bright reflective surface is the key to getting a well contrasted image of the projected eclipse. 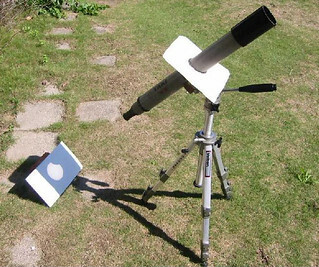 A similar method can also be used by using a telescope which involves projecting the sun’s rays via the telescope eyepiece on to a white piece of card. Another word of caution though as the eyepiece will be subjected to the sun’s heat over a period of time. The best advice is to use a cheap or spare eyepiece that you don’t mind rendering useless afterwards. Leaving the telescope uncovered throughout the whole eclipse will pretty much guarantee damage to the inside of the eyepiece. As explained in our eclipse phenomena page, during the moments leading up to totality things change dramatically and fast. There are so many effects to look out for such as baily’s beads, shadow bands, the chromosphere, the moon’s shadow approaching, prominences and of course totality itself. How you approach this is a personal choice. Budding astro-photographer’s will have spent time carefully choosing their imaging location, camera tripod position and camera settings and maybe an automated setup. Then will likely spend time snapping through various ISO and exposure settings to capture the perfect library of images of the event. Others may wish to simply sit back, relax and enjoy the spectacle with friends and family. However, if you want to witness some of the effects mentioned above, it will require some planning beforehand. For example, if you want to catch a glimpse of shadow bands, you’ll need to find (or make) an ideal surface on the floor nearby specifically for observing shadow bands for that short moment before totality. Some use white towels others go to great lengths to create the perfect surface type (and color) to observe these sometimes elusive effects. Observing the Chromosphere is also usually best viewed for a short moment seconds before (and after) totality hits. Observing prominences, the corona and the planets can all be done during the short 2 minute (or so) window of totality but wherever you are, be sure to take a short moment just to take in the color of the sky and horizon. Watch the world around you, feel the moment. For some this is a once-in-a-lifetime event. Take it all in and enjoy nature’s most wonderful spectacle. Many of you will choose to drive to the path of totality on the day from a nearby camp site or from home. 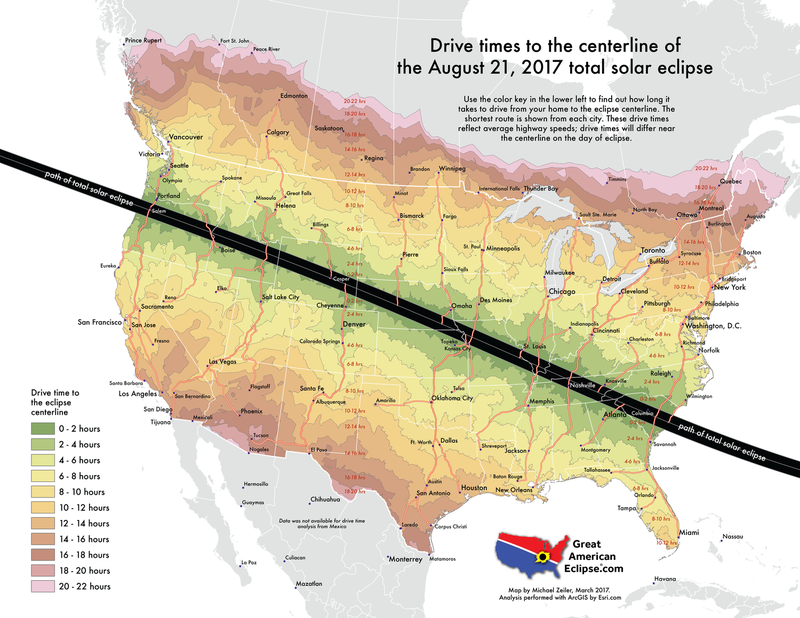 This provides the ultimate freedom of finding the best spot to watch the eclipse and get to places with good weather forecasts. This does require some forward planning however. It would be a good idea to plan your route to totality and check live traffic information on Google Maps. The excellent map below provided by Michael Zeiler outlines drive times to the centreline across the whole path. We’ll this is probably the single most important factor of the whole event for most observers but as we all know, nobody can predict local weather conditions well in advance. We can only go by average weather conditions and a best guess based on historical and geographical data. See our weather prospects page for a full breakdown of averages along the eclipse path. The only other advice to be given is that you have a better chance of seeing totality if you are mobile and choose an area with good road access along the eclipse path. A bit of background research, good planning and backup plans should get you a successful eclipse on the day.